This coming spring, Broad Street in South Providence will be redesigned, incorporating street murals, curb bump outs and an on-street biking and walking “trail.” The city has secured $2.5 million for construction along a 2.5-mile segment connecting the neighborhood to downtown on Broad, Clifford Pine, Friendship streets. 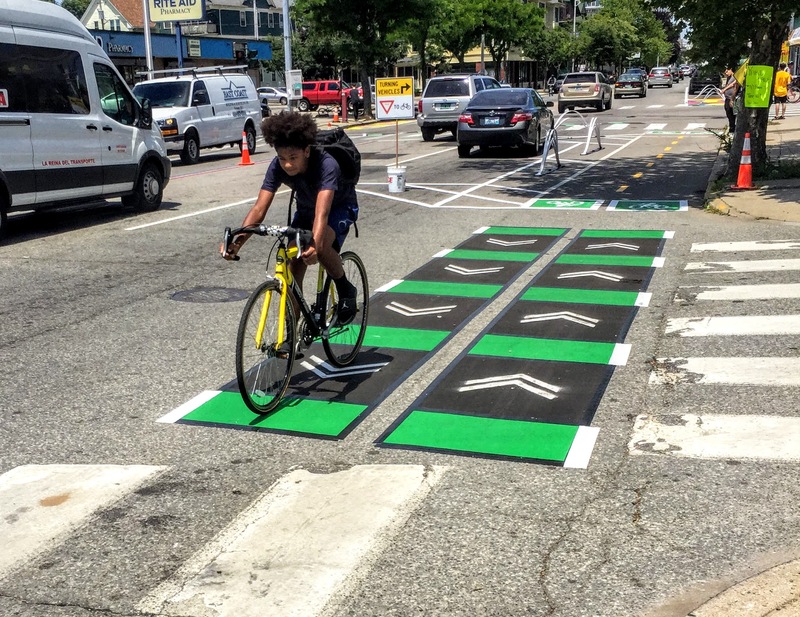 This summer, residents got to test out the concept during a two-day trial. Volunteers painted murals in key locations and installed the bike/walk paths along Broad Street. 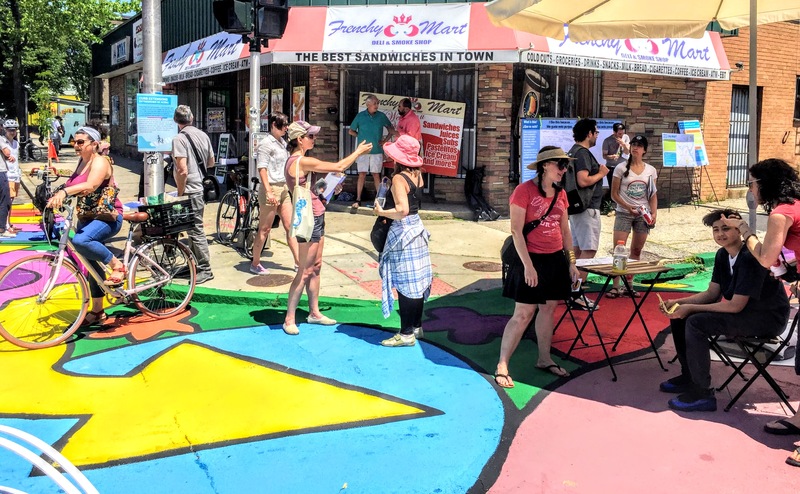 Designs from local artists Dana Heng, Tamara Diaz, and Lisa Perez were used to create pedestrian plazas and bump outs at some key locations where there have been safety issues. Providence is now moving to make much of the tested ideas (pictured above) permanent. The idea for a network of “greenways” emerged from the grassroots, neighborhood groups, last year and was inspired by the Indianapolis Cultural Trail. Other key segments of the network — called City Walk — are still somewhat conceptual. Haggerty couldn’t tell us exactly how long the whole system will be. But one key link is already under construction: the $17-million pedestrian bridge over the Providence River. The project takes advantage of left over trusses from Interstate 95, which is being relocated to open up new land in the city for development. When the pedestrian bridge — plus park spaces on both sides — is completed, it will expand City Walk to 3.5 miles and connect to the East Bay Bike Path. Using Jersey barriers filled with water for ballast, the city carved a safe walking and biking path out of a lane of car traffic. Broad Street sees more biking and walking collisions than any other street in the city. It's available in print in this week's Chicago Reader and online as a smartphone-friendly Google Map. Anton Seals from Grow Greater Englewood discusses the importance of respecting the neighborhood's history, and learning from the mistakes of The 606.